Support for this Fact Sheet was provided by First 5 California. Child care keeps parents working and families afloat, yet the high cost of care across California often forces parents to make difficult choices about who cares for their child while they go to work. This can be detrimental for families with low incomes, who often struggle to simply afford the basics. California’s subsidized child care and development system is designed to serve families with low and moderate incomes, but there are far more children eligible for subsidized child care than what is funded by the state and federal governments. This means that families with few resources are often unable to secure affordable care for their children. State and federal policymakers have begun to increase funding for subsidized child care and development programs in recent years. In California, policymakers have incrementally increased the number of spaces for children and boosted provider payment rates. State policymakers also took an important step forward by updating the decade-old income eligibility limits and implementing a 12-month eligibility period. These positive changes were long overdue and allow families to retain subsidized care for their children while they build a secure economic foundation for their families. However, these changes also mean that the small share of families receiving care remain eligible for longer periods of time, while substantially more families have become eligible. Without additional investments in new spaces for children, these changes could further limit access for low-income families. Governor Newsom’s proposed 2019-20 budget includes a large investment in young children. However, while the proposal expands full-day, full-year preschool and sets aside hundreds of millions of dollars in one-time funding for subsidized child care facilities and teacher training, it does not immediately expand access to subsidized child care programs for children from low- and moderate-income families, instead signaling that the Administration intends to significantly expand the number of children served in the years ahead. Since some parents have been waiting for child care for years, substantial investment in California’s subsidized child care and development system must include increased access to child care programs for children and families. This analysis is the first part of a multiphase effort to analyze subsidized child care and development programs in California. Future phases of this work will examine the unmet need for subsidized child care across different age groups and by race and ethnicity. Families are eligible for subsidized child care if the child who would receive care is under the age of 13; the family establishes an appropriate eligibility status, such as by having an income below the limit set by the state; and the family demonstrates a need for care, such as parental employment. Families generally must meet the same income guidelines applicable to child care to qualify for the California State Preschool Program (CSPP), which is funded solely with state dollars. State law, however, allows up to 10% of families in the state preschool program to have incomes up to 15% above the income eligibility limit, but only after all other eligible children have been enrolled. The CSPP is a part-day program offered for roughly nine months of the year. Some children receive “wraparound” services that provide subsidized child care for the remainder of the day and throughout the entire year. To be eligible for the full-day CSPP, families generally must meet the same guidelines regarding eligibility status that are applicable to subsidized child care. Budget Center analysis of US Census Bureau, American Community Survey data. Data limitations likely result in a conservative estimate of the number of children in California who are eligible for subsidized child care. For more information about the methodology used to calculate this estimate, see the Technical Appendix. 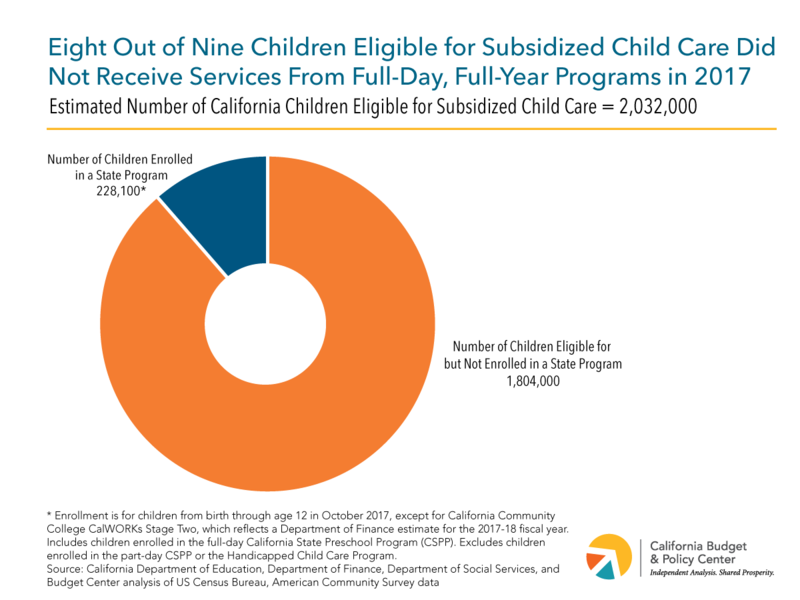 The 228,100 figure reflects children enrolled in the full-day CSPP or in one of the following subsidized child care programs: Alternative Payment Program; CalWORKs Stages One, Two, or Three; Family Child Care Home Network; General Child Care; and the Migrant Child Care and Development Program. Enrollment is for October 2017, except for California Community College CalWORKs Stage Two, which reflects a Department of Finance estimate for the 2017-18 fiscal year. This analysis also includes the full-day CSPP, which consists of part-day preschool and “wraparound” child care, because it accommodates many — although not all — families’ work schedules throughout the year, and thus approximates the experience that a child would have in a subsidized child care program. In contrast, this analysis excludes roughly 97,000 children who were enrolled in the part-day CSPP, without access to wraparound child care, in October 2017. This is because most families with low and moderate incomes likely need wraparound care in order to supplement the CSPP’s part-day, part-year schedule. This analysis reports enrollment data for a single month — as opposed to a monthly average for 2017 — because the California Department of Education (CDE) does not typically separate part-day and full-day CSPP enrollment when reporting monthly averages for a single fiscal year. The CDE also states, “Caution should be used when interpreting monthly averages as some programs do not operate at full capacity throughout the entire year (e.g., State Preschool) while other programs have seasonal fluctuations in enrollment (e.g., Migrant Child Care).” Finally, the data are for October 2017 because the CDE’s point-in-time reports are only available for the month of October. See Amy Rose, Modest Gains for California’s Low- and Midwage Workers (California Budget & Policy Center: January 2018). Estimate based on data from the University of California Berkeley Labor Center, Low-Wage Work in California (August 2018). “Low wage” is defined as earning less than $14.35 per hour. Kristin Schumacher, Dollars for Child Care and Preschool in 2018-19 Near Pre-Recession Levels With Boost From One-Time Funding (California Budget & Policy Center: September 2018).